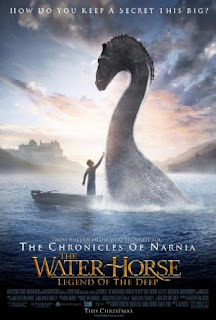 I don’t want to see “The Water Horse: Legend of the Deep.” Sure, it might be a good movie. Perhaps I really ought to see it. Still, I’m not in the mood. So… NO. Netflix, however, really thinks I need to see it. Right now. I’m wondering if any other Netflix users are noticing what I’ve been noticing lately, namely that the search engine has gotten really sketchy. A handful of recent releases turn up no matter what I am searching for: “The Water Horse: Legend of the Deep,” “In the Name of the King: A Dungeon Siege Tale,” and “Lars and the Real Girl” foremost amongst them. It seriously compromises the usefulness of the search engine and makes me a little suspicious. Is a glitch in the weighting algorithm that is overcompensating for popularity? “The Water Horse’s” modest 6.7 on imdb, with only 3,512 votes would seem to make that unlikely. Are we looking at some sort of insidious advertising campaign? Would they go about it so unsubtly? Below are some search phrases I tried followed by the rank from the top at which “The Water Horse” appeared. Most of them are legitimate movie titles. Pretty outrageous? I think so. If there is anyone else out there going through the same thing, feel free to send in your own amusing search results. Especially that Chronicles of Narnia thing. re: the godfather.Maybe a water horses head? I think I've figured out what is going on, after noticing a few more bizarre Water Horse appearances. I searched for "Night of the Hunter" and Water Horse came up 3rd. The first result informed me that the proper title of the film is actually "The Night of the Hunter." The interesting thing is that when I searched using the second string, with the additional "the," Water Horse came up second. Seeing that result, and comparing to your list, it's pretty clear what is happening: Netflix is weighting incidental and largely meaningless connecting words such as "of" and "the" as highly or higher than the other words in the title, and it has a secondary set of ranking criteria which clearly favors recent and/or popular movies. Since there are thousands of movie titles containing "the" and "of," searching for practically any movie title longer than a word or two will capture every other movie title containing "the" and/or "of." This is why searching for "Night of the Hunter" returns over 24,000 hits. I'm not sure whether to attribute this phenomenon to extreme naivete on the part of Netflix's programmers, or whether this is a more sinister plot to shoehorn recent movies into practically every search result (without the idiotic weighting of connecting words, sorting by popularity and recentness seems like a pretty legitimate ranking method). Either way, I agree with you--it certainly decreases the usefulness of the search engine: someone who mistakenly searches for The Night of the Hunter when they actually want to see Night Hunter (bear with me here) will probably give up in frustration before realizing their mistake. I'm totally getting The Water Horse in almost every search. Yes! And I thought I was going mad..